Born in 1802, Hugo was a key figure in the Romantic movement and looked for contemporary meaning in past history. 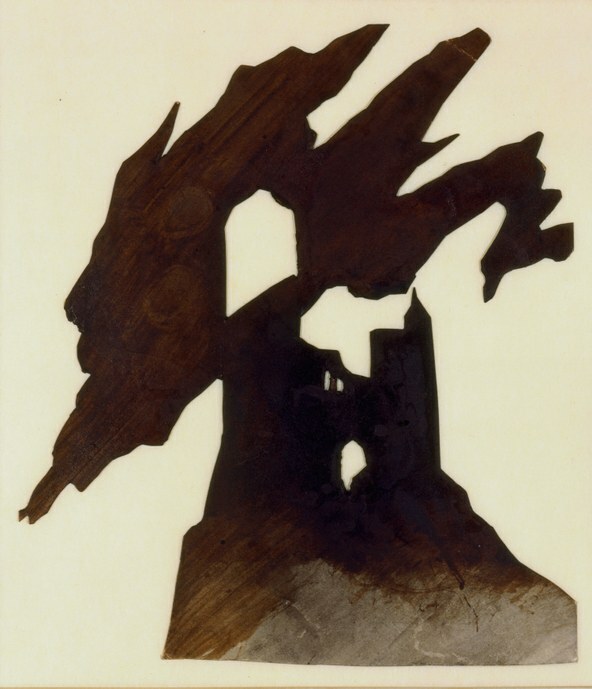 The exhibition of rarely seen drawings and prints includes many renderings of Gothic buildings, especially churches, mostly in emotive, tenebrous tones. Hugo personally felt the centuries of history and faith symbolized by these structures. They offered solace during his long and tumultuous life. 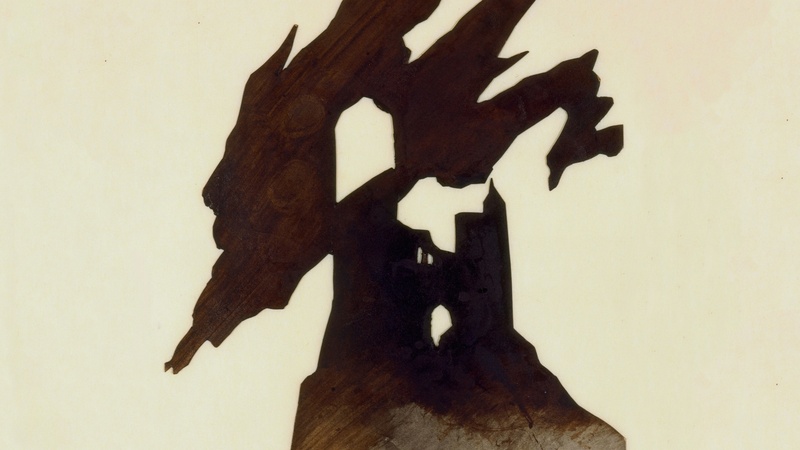 Using a stencil cut in the shape of a building, he could pour ink in ways that left a darkened silhouette surrounded by soft edges. Many of the works were done with the same quill and ink that he used to write his manuscripts. 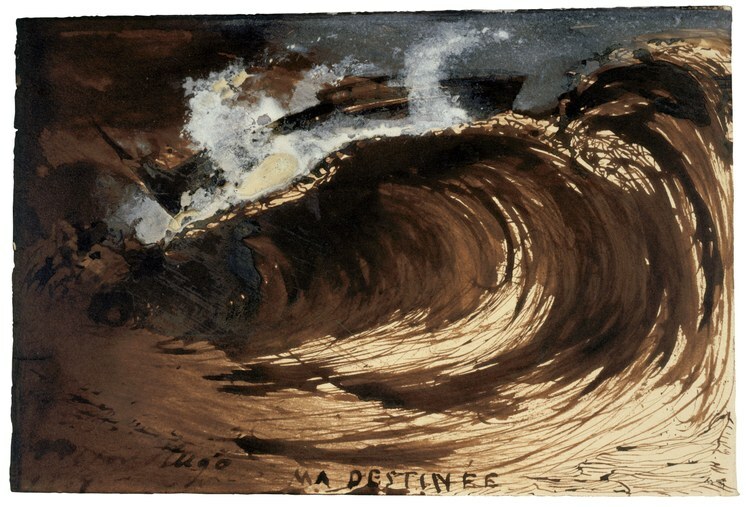 After drawing with the nib, he would flip the pen over to use the feathers to make the brushy shapes of waves in paintings of crashing seas. Hugo rarely showed these works, considering them as creative breaks from his true art of being a writer. In rare instances, he would allow a drawing to be reproduced as a print. 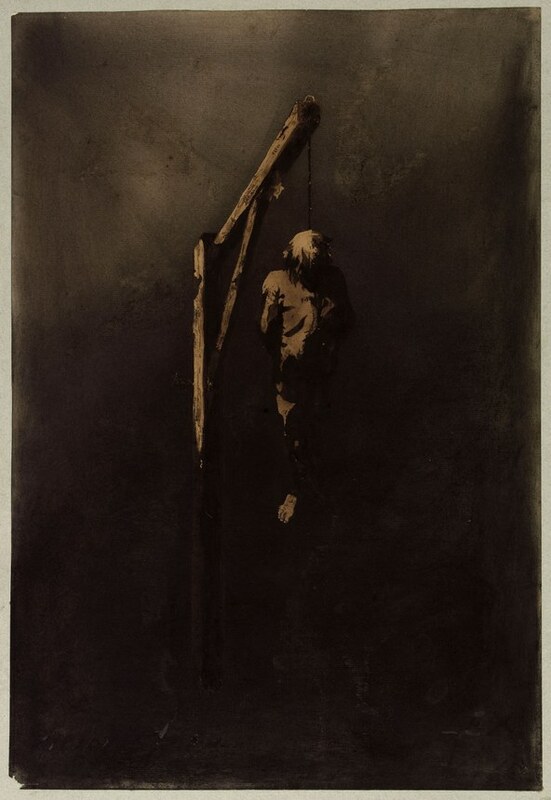 An outspoken critic of the death penalty, Hugo’s drawing of a man hung from a gallows was later retitled “John Brown” and widely reproduced as a print to protest the 1859 execution of the American abolitionist. There are few such figurative works by Hugo but he did devote considerable attention to the skies, using a circular stencil to make evocative views of the moon, works that morphed with washes of various gray tones and floating spheres. Hugo’s progressive views made him a key figure in the complex political shifts in France throughout the early 19th century. It was in 1851 that he led a resistance movement against Louis- Napoleon Bonaparte’s coup. He was forced to flee to Brussels to avoid arrest and remained in exile for nearly 20 years. With the proclamation of the Second Empire, Hugo was officially expelled from France. Previously, Hugo had traveled widely in Europe, where he did many of his drawings. In 1856, Hugo bought a house in Guernsey, the island that lies in the Channel between France and Britain. Many of the works from that time appear melancholic. Ever Francophilic, Hugo never lost touch with his native country. The show includes a clearly staged photograph of Hugo sitting atop a massive rock looking out to sea, at the country he’d left behind. (Hugo had a darkroom built at his Hauteville House in Guernsey and his son became his official photographer, documenting scenes that Hugo wanted to presesrve.) It was in his room at the top of that house, with views of the sea and sky, that he completed his masterpiece, Les Misérables. Hugo returned to live in Paris, as hero of sorts, in 1870. His drawings came to be known to his many fans but they gained more attention for their experimental methods after his death in 1885. This fascinating exhibition was organized by Cynthia Burlingham and Allegra Pesanti of the Hammer. 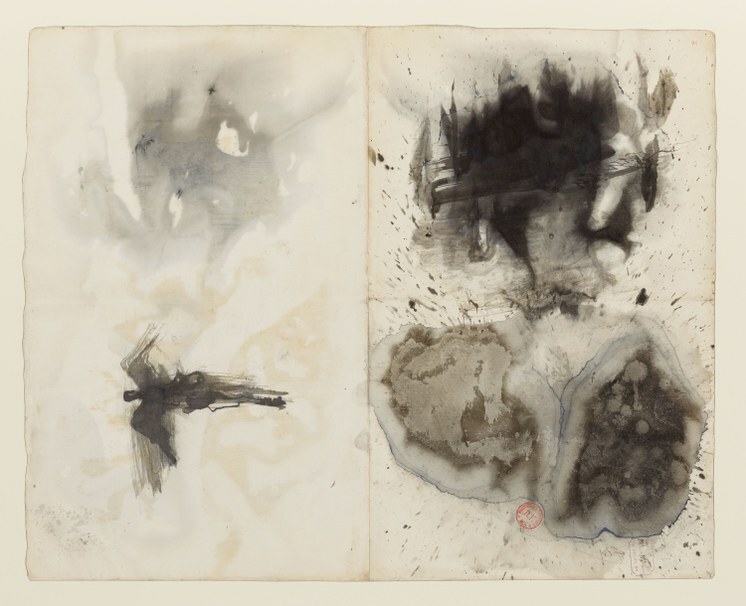 Yet, it has a special history of its own: Hammer director Ann Philbin was the first to organize an exhibition of Hugo’s drawings in the United States back in 1988, when she was at the Drawing Center. 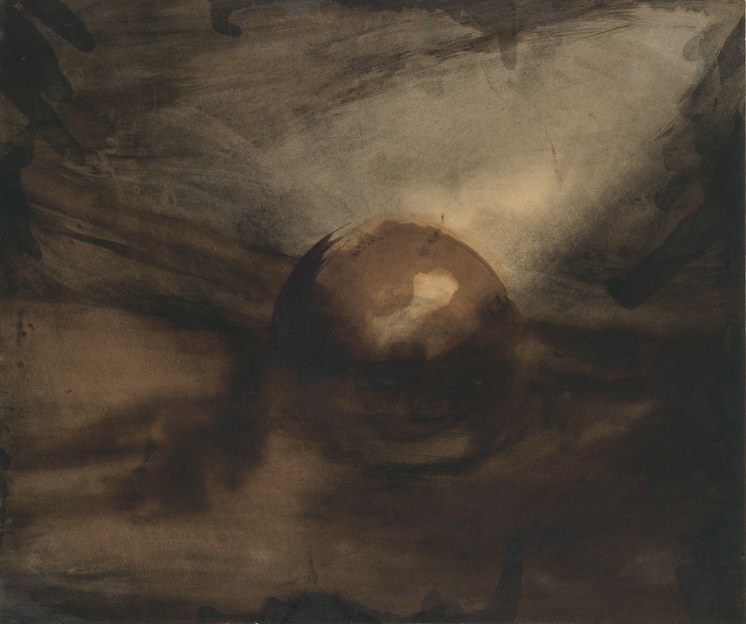 On Monday, Oct. 22, at 7:30 p.m., there is a performance and installation related to Hugo’s work called Ceiling of Shadows: A Night of Victor Hugo. For more information, go to hammer.ucla.edu. The exhibition continues through December 30.